Cinco Puntos Press - Cinco Puntos Press, 9780938317777, 40pp. Martha Tom, a young Choctaw girl, knows better than to cross Bok Chitto, but one day--in search of blackberries--she disobeys her mother and finds herself on the other side. A tall slave discovers Martha Tom. A friendship begins between Martha Tom and the slave's family, most particularly his young son, Little Mo. Soon afterwards, Little Mo's mother finds out that she is going to be sold. The situation seems hopeless, except that Martha Tom teaches Little Mo's family how to walk on water to their freedom. Choctaw storyteller Tim Tingle makes his living telling stories and teaching folklore at schools, universities and festivals nationally. The Wordcraft Circle of Native American Writers and Storytellers selected Tim as "Contemporary Storyteller of the Year" for 2001. Tim Tingle lives in Canyon Lake, Texas, near San Antonio. Artist Jeanne Rorex Bridges traces her heritage back to her Cherokee ancestors. Born in Oklahoma, her work is nationally known and has won many awards in Native American art shows, including the 2005 Best of Show at the Five Civilized Tribes Museum. 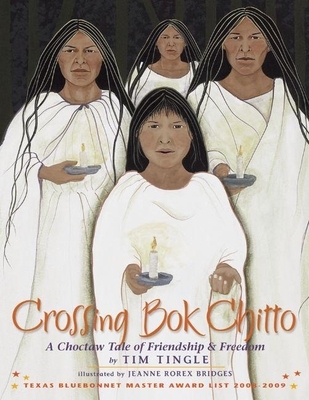 Crossing Bok Chitto is her first fully illustrated book.